Home > Resources > Freight Guides > Forwarders / Quoting > What is a Bill of Lading? Ocean freight is a trillion dollar business that hinges on buyers getting goods and sellers getting paid. That mostly comes down to one incredibly important freight document – the Bill of Lading (BOL, B/L, BL, Sea Waybill). In this article, we will explore what a BOL is, how to fill one out, and the different types you might encounter. What is Included on a Bill of Lading Form? The word “lading” is an archaic form of “loading”. Blackbeard would have used it when piling more booty onto his pirate ship. The bill of lading started out as a receipt issued when a shipment was loaded onto a vessel (not that Blackbeard was too fussed about paperwork). It is still used as a receipt at pickup, handed to the seller as proof that the goods were handed over. It is also a receipt that the shipment was handed over in good condition unless a note to the contrary is made on the BOL at pickup. The second role a bill of lading plays is as a shipment contract. The terms and conditions of the forwarder arranging the international transit are included on the bill of lading. Technically, the contract begins when you accept the forwarder’s freight quote but the Contract of Carriage is evidence of that contract, otherwise, why is the shipment being picked up for international transit? Forwarder terms and conditions are usually written on the reverse side. And it turns out that forwarders (carriers too, for that matter) limit their liability for the shipment if something goes wrong. That’s why taking out comprehensive cargo insurance is so important. The third role a BOL plays is as proof of ownership. Technically, the commercial invoice does that. The buyer and seller select freight terms (Incoterms) when putting the deal together. The Incoterm listed on the commercial invoice sets the point during transit when the goods change hands. Possession is nine-tenths of the law, and possessing the bill of lading has come to be used as proof of ownership. The seller gets it in their hands at pickup. Later on, the buyer will need it for shipment release. Tracking: If the master bill of lading number (more on that later) is recorded on the BOL, it can also be used for shipment tracking. Other tracking identifiers, like container numbers, are often recorded on the BOL. Payment: The bill of lading is one of the key documents submitted in the Letter of Credit (L/C) process. Insurance claims: The BOL must be submitted when filing a claim for lost or damaged cargo. Insurance liability: If a bill of lading has been issued in a freight forwarder’s name, they can be liable for damage to freight – even if they don’t handle it. Forwarders create their own forms, each with their own design. Fortunately, they all essentially have the same information and in roughly in the same place on the form, as laid out in this conceptual design. The following tables explain each of the sections in more detail. Shipper Name and contact details of the seller (factory owner or supplier), unless an L/C specifies otherwise. If “to order (of) …” comes before the consignee’s name, the shipment is negotiable by endorsement. If the field is left blank or states “Bearer”, the shipment is negotiable even without an endorsement. 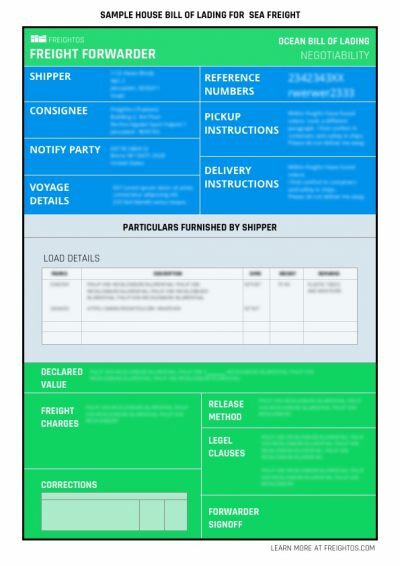 Notify Party Name and contact details of any other party that should be notified, such as the destination customs broker or third party warehouse. Voyage Details The port to port ocean leg. Carrier booking details, e.g. carrier name, vessel number, voyage number, and ports of loading/departure and discharge/entry. Place of receipt by the carrier, ie, the port where the shipment is handed over to the carrier. Place of delivery by carrier, ie, the port where the carrier hands over the shipment. Place of the pickup, including country of origin. Forwarding agent contacts and references. Carrier pre-carriage (rail/barge) details – if applicable. Point of final delivery for the goods. Forwarder’s reference (house BOL) number. Carrier booking number and/or master BOL number. Other reference numbers, e.g. export references. Load Details These usually sprawl over several columns in the central section of the form. Markings made on the packages for identification (e.g purchase number). Number of packages by type, e.g. 3 pallets. A general description of the goods (may require an attachment sheet). Other pertinent information, e.g. hazmat status, product information for Customs, container number. Space for the shipper to write the declared value. Clause limiting carrier liability based on declared value. A handful of countries require freight charges to be recorded on the BOL. Freight payable according to the incoterm, e.g. “port of load (prepaid)” for FOB. Freight payable sometimes appears near Delivery Instructions. Corrections Amendments made to the BOL, e.g. changes to weight and dimensions made by the port authority after VGM weighing. originals required: physically possession of hard copy form. Using originals is slower and more expensive, but is still preferred when paying by L/C – with the bank only triggering payment when all originals have been delivered. Sometimes, payment occurs before delivery. If the shipper notifies the forwarder, the release of goods can occur without originals. This hybrid method is called telex release. Clause for shipper (Loading Receipt). Clause for consolidation liability (either shipper or forwarder). Clause that forwarder’s standard T&Cs apply or reference to full T&Cs “on the back”. May also include a summary of terms. Forwarder Sign-off Place of Issue, Date of Issue, and Signature. Forwarder Specified at the top of the form. Logo, name, and sometimes contact details. Negotiability Usually specified at the top of the form, and/or in the consignee field. Most BOLs are marked negotiable, meaning the goods can change ownership while in transit. Only large companies shipping in-house or between sister companies should mark the shipment as non-negotiable. The Bill of Lading described here is the contract of carriage between the forwarder and their customer. It is more properly called the House BOL, to distinguish it from a very similar document called the Master BOL. Both BOLs are created for each international shipment, but the Master Bill of Lading is the contract of carriage between the forwarder and the carrier. Incidentally, most information online is about the Master, not the House, document. The Master Bill of Lading also acts as the forwarder’s receipt of delivery and contract of carriage. The end customer doesn’t get a copy of this document, but their forwarder should provide them with the Master Bill of Lading number. It acts as a tracking number while the shipment is in the carrier’s hands. You will first see the House BOL as a draft. Soon after reserving a carrier booking, the forwarder will send a draft to confirm weights and dimensions. It is important to check them because the departure port will weigh the shipment and any discrepancy may lead to fines being imposed and the BOL being updated. As well as checking weights and dimensions, the customer should also carefully check that all other information is correct. Even minor discrepancies between the House BOL and the commercial invoice or shipping records could trigger costly customs inspections later on. When using original copy release, be careful not to lose your copy. It’s much more tortuous than the forwarder simply writing out and sending a replacement. There’s more than importers could learn about the Ocean Bill of Lading, for instance, how a Trucking Bill of Lading or Air Waybill is different again. The Onboard BOL is the receipt given by the carrier when the shipment has been physically loaded onto a container ship (for ocean freight) or airplane (for air freight). If the carrier determines that the goods are not in good condition when they are received, then they will add a clause. The bill of lading is then referred to as a foul or claused bill of lading. The carrier may also note on the bill of lading that the shipment was received in good condition (Clean BOL). An Order BOL refers to the scenario where delivery is dependent on the seller being paid. This makes the bill of lading a powerful tool, that, when endorsed, acts as collateral or can be traded as a security. When endorsed by the carrier as having been received for loading, the bill of lading acts as a receipt for the freight forwarder that they have delivered the goods. It is not proof that the shipment has been loaded on board. The Sea Waybill is a simplified version of a House BOL, except it doesn’t act as a document of title. That leads to smoother shipping and, because of that, it is gaining in popularity. A Straight BOL refers to the scenario where the seller has already been paid and the carrier can deliver the shipment “straight” to the consignee.